December 15th 2009 — de GRISOGONO has opened a boutique in Las Vegas at Crystals, the new premier luxury shopping destination at the City Center. A new space filled with baroque touches that reflect all the magic and creativity of the jewelry and watch making brand created by Fawaz Gruosi. 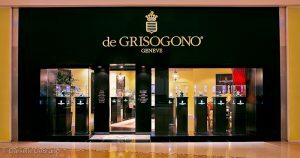 After Geneva, London, Gstaad, Hong Kong, Rome, Porto Cervo, Paris, St. Moritz, Kuwait, New York, two in Moscow, Tokyo, Saint-Barthélemy, Dubai and New Delhi, it is in Las Vegas that de GRISOGONO has chosen to open a second boutique in the United States, which brings its worldwide total to 17. Those who already know the de GRISOGONO “style” will be surprised upon entering this new boutique, because unlike the rest, it will have a new décor. Faithful to the brand and closely following Fawaz’s vision, this new treasure trove will appear as a more modern version of the other boutiques around the world. All in a space of 85 square meters, in the most luxurious of style, the interior highlights the company’s traditional yellow and grey walls, dark cherry hardwood floors and imported furniture from Florence. The exterior is in sleek black and modern, shining the company’s brand name in gold.